The little Buzzstop honey sign sits on Queenstown’s busy state highway. The traffic streams past unaware that just over the paddock lies a sweet, rural delight. Recently, I went to visit Nick Cameron of Buzzstop Honey Centre to get the buzz on his latest venture. The old girl was sagging at the seams. 70-years worth of bird droppings encrusted every beam. An ancient smell of sheep wafted up through the open floor grating. Even in the thin winter light, Nick could see the thick piles of dung below. He kicked at the thin, slippery boards which covered the floor. “Whose crazy idea was this, anyway?” he grumbled. “Yours, mate” the others chorused, hoisting the wheeled scaffold through the gaping doorway. Nick clambered up the ladder, heaved the first bucket of hot soapy water and disinfectant up behind him and took out his scrubbing brush. It was time to start work. Not everyone can take a derelict building and realize its possibilities. But Nick Cameron had a bee business idea buzzing in his brain. In fact, he’d been looking for the right place for months. When he spotted the old woolshed Nick knew his search was over. Covered in grime, sure, but the rural location was perfect. And it was only 2 minutes drive from Queenstown’ s international airport. Now he just had to muster up the courage to approach its owners. Perhaps the Grant family were surprised to find a complete stranger knocking on their door asking for their woolshed. But Nick’s enthusiasm is contagious so they came on board. Looking at Buzzstop’s gorgeous wood and concrete floor you’d have no idea of the work that went into it. In winter, it was horrible. To clean this I was in here with no power, in the middle of winter, with the wind just charging through. On my hands and knees with a hammer and chisel. This is where the sheep stand while they wait to be shorn. That’s why the floor is a grating, so their dung can fall through the gaps. But the grime grinds into the boards. I would hate to try and clean this grating in our woolshed. But cleaning was only the first part of the job. The whole expanse then had to be lined underneath with plywood. Nick and his helpers poured the concrete by hand. Next came the sanding, then grinding. They took the whole lot back to the hardwood before finally coating and polishing it. Nick grew up with beekeeping in his blood. Over 100 years ago his mother’s family began tending hives in Otago’s Ida Valley. And the family’s passion has continued through the generations. Aged 17 he got his first job as a guide and loved it. That combination of interacting with people and being outdoors was Nick’s dream lifestyle. So he began to travel the world as an adventure guide. Eventually, Nick landed in Sydney. He set up business offering Whale watching and rigid inflatable tours. 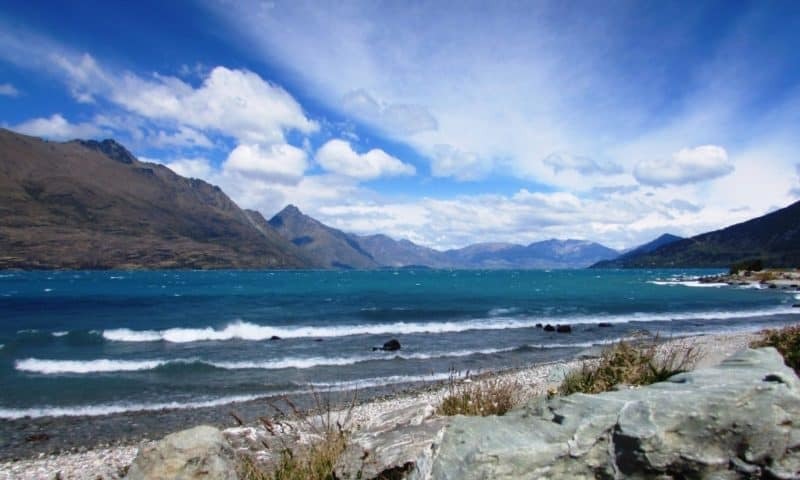 Guiding on the sea sounds perfect, so what brought him home to Queenstown? And that was when Nick’s beekeeping roots kicked in, and the Buzzstop story began. Nick’s vision was clear. He could see there was a tailor-made niche for him, combining beekeeping with guiding. I could see so many shops selling honey, but we wanted to add in experiences … to give people the back story of how the honey got into the jar. People are beginning to care about where their food comes from. At the same time, as more and more of us cram into cities, we actually know less and less about it. But there’s even more to it than that. These tiny heroes have a critical role to play as pollinators. Without them many of our current food plants are unlikely to survive. So Buzzstop’s mission is very much about encouraging knowledge and respect for bees. Being a parent of young children himself, Nick also wanted a place where everyone could feel at home. So he created a garden for adults and children to enjoy. This was once 2 sheep pens full of 8 foot high weeds and took 6 months to clear and plant out. Hard to imagine now, but easy for everyone to enjoy. Most of the plants are bee-friendly — think manuka, thyme and lavender to name a few — and are part of Buzzstop’s learning experience. What’s In The Buzzstop Experience? Nick and his team have such a variety of bee experiences at Buzzstop. Surely there’s something for everyone here. Buzzstop is not exactly a cafe: they don’t have a kitchen and bring in most of their food from local eateries. But they do have a few specialities which the staff make onsite. Light and tasty Belgian waffles are one, and delicious homegrown salads are another. Nick is beyond grateful to the Grant family who have allowed him to run with his Buzzstop vision. Buzzstop works beautifully with its next door neighbour, The Barn. This charming little shop has been on Hansen Road for nine years. Inside there’s an eclectic mix of vintage and new furnishings. Wander in a little further too. You’ll find rooms of clothes, gorgeous knickknacks and more. It reminded me of Aladdin’s cave, alas without the gold. Nick in the Buzzstop Maker space. 2018-19 is just Season One for Buzzstop. They’re still growing and getting their name out there. But Nick has big plans. Driving out to see the apiaries around rural Queenstown would be awesome, but Nick’s also got some high-end plans. Nick may have big plans for visitors but he’s focused on serving local tastes too. “For a long time Queenstowners had no way to access local honey but now they can find it here,” he says. You can too — the shelves are full of honey jars from small, family-run honey businesses all over Otago. He has other local initiatives too. There are plans afoot to open a Community Apiary in Spring, 2019. How good would that be? You could keep your hive there and get help whenever you need it. Nick and his team are doing a great job of bringing bees with a difference to Queenstown. Next time you’re there, buzz in and check them out. The Athol Valley Market is a welcome addition to the summer scene in the Upper Mataura Valley villages. I went along to talk to local organiser Amanda McMillan about her latest venture. At the heart of a local market is the sense of community. People want to come together and support their local artisans and businesses. It’s less about dashing in and out to grab groceries and more about lingering to chat and chill. And that perfectly describes the laid back vibe of the Athol Valley Market and its host The Hide. In fact, Amanda and Hide owner Meegan have a shared goal to support local enterprises and the diverse community found within the Upper Mataura Valley. Meegan and Amanda with The Hide’s latest delicious offering. You can buy Gibbston Valley Cheeses at the Athol Valley Market on Sundays and at The Hide every day of the week. This cosy market is for all the locals of Athol, Garston, Kingston and beyond as well as the passers-by who know a good thing when they see it. Most Sundays you’ll see tourists, as well as locals, browsing the stalls, and relishing the opportunity to stop and shop. Hillary’s an Athol local. When she left India she stocked up on sturdy, beautiful Indian bags which she now sells at local markets. These colourful bags are hard to resist. The stall holders are a varied bunch and the goods on offer change from week to week. You never know quite what you’ll get at the Athol Valley Market. Gardens Without Borders: Recently relocated from busy Queenstown to laid-back Lumsden, Josie’s just starting out on her gardening dreams. I love the philosophy behind her passion and her produce was so fresh and inviting, I wanted to buy the lot! Fresh food stalls are the stars of a local market. The fruit, vegetables and eggs stalls have come and gone as summer became autumn. Some gardeners’ produce is coming to an end but Matt Menlove has been a stalwart, bringing his sweet honey and garden vegetables to sell every week. There’s no shortage of honey around the Upper Mataura Valley, thanks to an enthusiastic group of local beekeepers. Matt Menlove and young Brie are often found selling their sweet jars at the Athol Valley Market. The local children have had their first taste of business this summer, too. They’ve industriously set up a wide-ranging variety of stalls over the season. We’ve seen honey, vegetables, flower bulbs, cakes, sweets, toys, face painting and — winning the prize for most unusual child stall — painted rocks, kina and paua shells for sale. I’m not sure which is more winning, the produce or the kids’ beguiling smiles but they all seem to have gone home happy. One thing that Amanda’s learned while organising her first market season is that market people are a helpful lot. She’s been chatting to market organisers from markets around the area and they’ve given her many tips of the trade. She’s incredibly grateful for their help, because organising a weekly market is no easy task. Rob and Jan from Dipton sell their handcrafted, sheepskin, wallaby or possum-fur slippers online and at markets all around Southland and beyond, They inherited their pattern from its 92-year-old creator and are proud to be able to continue his tradition. If you haven’t taken the chance to chill out at the Athol Valley Market over the past few Sundays take heart. There are still a few market days to come. Amanda and Meegan are hopeful that the sunny days will hold and the market can continue till Easter. Josie Robinson, from Tuturau makes pickles, relishes and sauces — mostly from organic ingredients. First-time customers quickly become raving fans. You can find Robbies online or at many of the markets around Southland-Otago. So pick up your purse and cruise on down to the Athol Valley Market this Sunday. Take in a little food, chill to the music, soak up the sun – or shade – and take the chance to buy fresh food, art and crafts or that little luxury you’ve always wanted. Amanda’s been experimenting with themed days at the Athol Valley Market over the summer. She had a great response from restored vehicle enthusiasts for her Motors at the Market Sunday in March. Here are just a few of the beauties on display. Craft Keepers is a cute little container store full to the brim of locally-made crafts and The Coffee Bomb is even tinier – a trailer selling delicious coffee, burgers and snacks. Both businesses may be in Garston but their owners are Athol locals. You can read Tabatha’s and Kylie’s stories here on the blog. Kids and puppies are inseparable when they’re young and they inevitably end up teaching each other a few valuable life lessons. Even though our kids have long ago grown up, our son decided that I needed to keep honing my puppy-raising skills. So, here’s a quick look at some of the cutest babies currently on the farm. Rose is the undisputed team leader of Chris’s dogs. The first pup he ever raised, she’s become a classic heading dog: small, slender and sassy. When you put her with sheep she’s all business. You’ll see her crouched low, eyes fixed on her target, ready for business the moment Chris gives the command. Time has sped by since Rose first came on the scene and already she’s 6 years old. In November, Chris decided that if he wanted to breed from her the time was now. So he played matchmaker with a friend’s equally talented dog… and we waited… and waited. It seemed a long time before Rose began to show signs that she might be pregnant. But as she went from scrawny to roly poly we got the feeling that she had plenty of puppies inside. Chris built a secluded puppy-raising sanctuary under the walnut trees, far from all distractions. With a spacious kennel and a ramp for when the pups were ready to climb out it had everything a new mum could want. “I hope she doesn’t eat them,” Chris remarked the day they were born. Well, that gave me something new to fret about. But we needn’t have worried. Over the next few hours, Rose gave birth to ten gorgeous puppies and proved herself to be an exemplary mother. Rose watching out for danger during her first few days of motherhood. Rose was very much on guard for the first week. Even Chris only approached her at mealtimes; the rest of us kept a respectful distance. Eventually she calmed down enough to let us “raid” puppy headquarters. At ten-days-old the pups were little more than squirming sausages. Eyes tight shut, feeding and sleeping were the only things on their little minds. A week later their eyes were open and they were just starting to toddle. Now they were the perfect size to meet the farm’s other beloved toddler — our grandson, 19-month-old Harvey. Harvey soon learned how to be gentle with the puppies. Puppies grow fast and at 5 weeks these little guys kept busy all day playing around their kennel. Puppies playing from Lyn McNamee on Vimeo. They didn’t stray far from home — until one memorable morning. Racing down the ramp came the hoard of yapping puppies. Pushing and squirming, they dived into their two big bowls of breakfast milk and biscuits, while Terry tried to count heads. He counted again — still nine. Hmmm! “One puppy’s missing,” he reported. I choked on my cereal. This would happen the week Chris had gone mustering and left us in loco parentis. We levered up the kennel to see if he’d burrowed underneath. Nope! “People drive past so fast,” I thought. “They wouldn’t notice a puppy…” I dashed out to the nearby gravel road, praying. But there wasn’t a puppy in sight — thank goodness. Rose had wandered off. Chris had left her untied because caring for ten rough-and-tumble infants was taking a severe toll on her limited supply of patience. Could the pup have followed his mum? I searched the other dog kennels… under the trees… over by the tunnel house… in the long grass. Surely he’d be crying if he was lost and far from home? Just one little bark came from the patio rose jungle beneath our lounge window. Thorns scratched my hands as I peered into the murky undergrowth. One brave puppy stared back. Puppy number ten, AKA Tarzan. Puppy number ten must have told his brothers and sisters about his adventures in the big, wide world because after that we found puppies everywhere. There were puppies on the carport… puppies chewing the boots. Puppies in the garden… puppy poop on the lawn… puppies chasing the ducklings. And driving the car down the drive became a task fraught with danger. Rose has the haunted look of a mother dog who’s had enough of feeding this many mouths. And Rose wanted nothing more to do with them. She had taken to spending most of the day sleeping on our carport couch — well out of reach of her mischievous brood. “Build those pups a pen or I’ll shut them into a dog motel,” I threatened. Do you think they’ve stayed in the spacious pen that Chris erected next to his dog kennels? Of course not! There’s always a puppy or two pushing under the netting. We spot them sleeping with Archie in his kennel, or visiting their mum for a surreptitious snack. But they’ve stopped wandering far and wide, for now, and ten pups always turn up for meals, so we’ll count that as a win. Milk and puppy biscuits – yum! Working dogs are the backbone of a sheep farm, and a good heading dog saves a farmer hours of work. They rarely bark — it’s the huntaway that makes all the noise. These pups will control the sheep with stealth, position and sheer willpower. Heading dogs are bred to run for miles and to think for themselves. What’s more, the herding instinct is in their DNA. Lacking sheep, you’ll often find young dogs rounding up chickens or even attempting to herd small children. With their energetic heritage and herding DNA these pups are bred for farm life — that’s where they’ll be happiest and do their best. The McNamee family always had plenty of ducks and chickens on the home farm back when Terry was a lad, but they’ve been gone for years now. Do you think that we were pleased when Chris surprised us with a collection of Muscovy Ducks one spring? Discover their “ducky habits” in Muscovy Ducks On The Farm. There are always plenty of babies around the farm at springtime. After all, breeding sheep is what we do best. So Spring tends to be happy, hectic and sometimes harrowing at lambing time on the farm. Do you have fond tales of animal babies too? We’d love to hear them. Post them in the comments box below, or contact me if you’ve got a longer story to share.